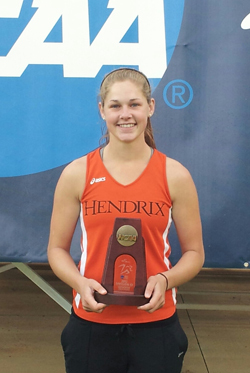 Hendrix College sophomore Elizabeth Krug earned All-American honors for the second consecutive year in the heptathlon at the NCAA Division III Outdoor Track & Field Championships in Claremont, Calif. The Heber Springs, Ark. native finished sixth place overall with a school record 4,726 points. She took seventh place as a freshman in 2011.